Yeah, but: They last forever. The Long Version: I've bought two of these in my life, and this is the first one. It's about fifteen years old, and while it has worn down a little, the diamond sharpener still does its job. Made by DMT, it has a plastic base with industrial diamonds embedded in a nickel-steel plate. 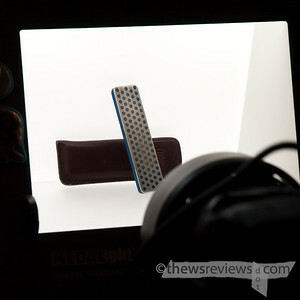 This is the 4" version, which comes with a handy leather case. I also have a longer version that I can't find on their website, which has a handle that folds over the sharpener balisong-style. It's not as solid, so I still use it laid flat on a table, but since it's double-sided I need to put something underneath it to protect the surface. All told I like this one better. 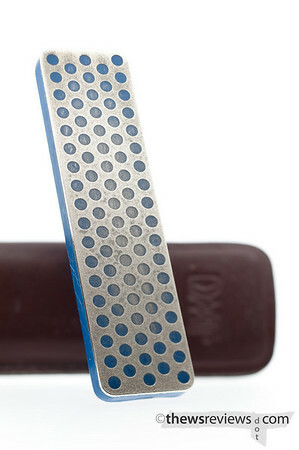 There's nothing special about a diamond sharpener versus a regular whetstone. The diamonds work faster, but that just means that it's faster to make mistakes. Technology is no substitute for skill, so take your time and learn how to do it properly - I'd provide a link if I could find one that I agree with. (Hint: arbitrary angles for the bevel are arbitrary.) The 4" size is good for pocket knives, but are too small for my level of patience with anything from the kitchen or the toolbox. There are others available, and it is a fundamentally good idea, so if that's important then there are larger ones out there waiting for you. Thanks. An area where I need to build my skills, so your review is much appreciated.